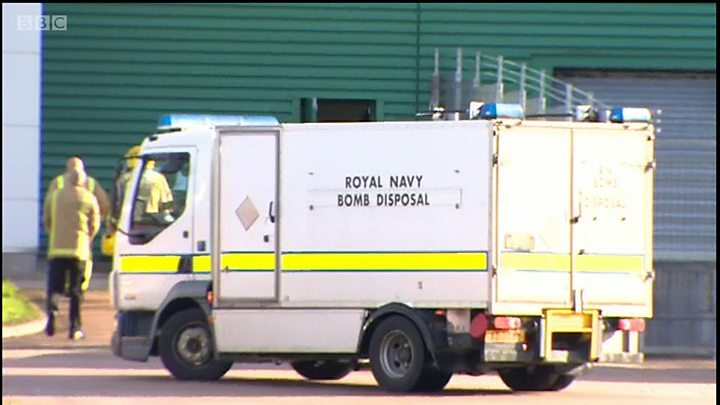 A suspicious package that led to a Royal Navy bomb disposal team being called to an Amazon depot in Inverclyde was not a viable device. Police Scotland said that the package appeared to have been "some sort of tracking device". It has been removed and will undergo further forensic examination. Staff members were evacuated from the building in Gourock as a precaution after the alarm was raised at 05:15 on Friday morning. The bomb squad were called, and an officer in protective gear was seen walking towards the building at about noon, before returning 10 minutes later. A police cordon in place throughout the morning was removed at about 14:00. In a statement, Police Scotland said: "Police Scotland can confirm a suspicious package found at the depot in Gourock this morning is not a viable device. "The item appears to be some sort of tracking device. "It will be disassembled by EOD personnel and will be removed by police for further forensic examination. Inquiries are ongoing." Staff were waiting outside the depot, and a queue of delivery lorries formed while the building was closed.